One of my personal favorite details of a wedding day, is of course the flowers. I’m such a sucker for the alters, tablescapes, and entrances that are decked in fresh blooms! I am so excited for the 2019 wedding season because that means more opportunities to photograph gorgeous flowers! Since we’re still at the beginning of the year, some of you might have not even started considering what kinds of flowers or bouquets you want for your upcoming wedding! Whether you’re frantically searching for 2019 bouquet ideas, or haven’t even had the time to start brainstorming, I think you’ll find this post to be insightful! Below I’ve listed six different ideas for your wedding flowers. Either bookmark this tab, or start taking notes because this is going to give you all the inspiration you need! If you’re the type of gal who just wants an elegant, simple, classic affair, consider a bouquet like this one! 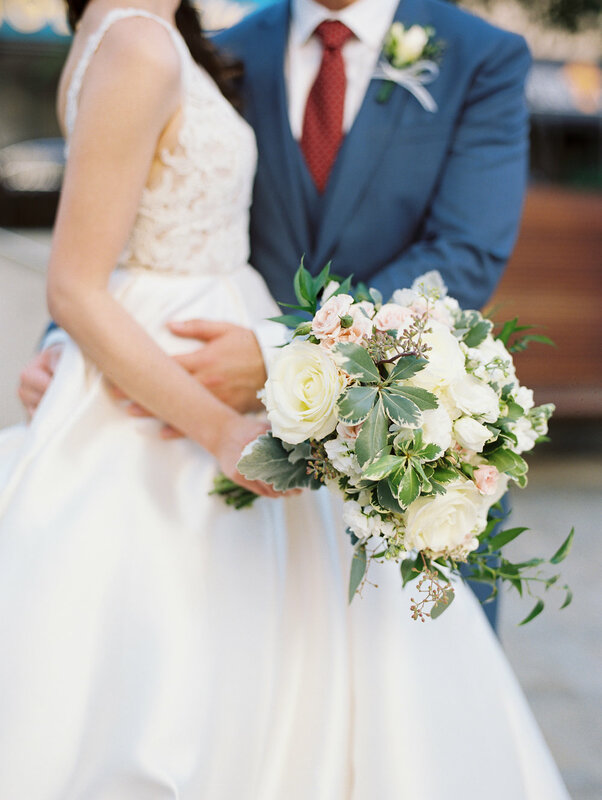 This classic palette of greens, white, and a hint of light pink is absolutely timeless. There’s something so completely romantic about using roses in your bouquet. They seriously never get old! I was so lucky to have been featured on Martha Stewart Weddings for this bouquet! If you can look closely, you can see beautiful some dogwood. Adding dogwood to your wedding bouquet is not only unique, but it adds such a romantic and fairytale element to your wedding day! Ask your florist for other unique blooms to add to your bouquet this year. In the past I’ve even seen kumquats used in a bouquet, so anything is possible! I’m such a sucker for a punch of color in an otherwise muted bouquet! I think the pop of vibrancy really makes your flowers stand out in a beautiful way. This one by Revel Petals blew me away! The soft muted greens and whites really make the Poppy, Orchids, and other pinks stand out! Color is a talent in itself, so make sure you work with a florist who is experience in this area! The bright hues in this bouquet are also similar to the ones on Pantone’s spring/summer palette, so if you’re into the world of color, start there. And speaking of Pantone, we have to talk about Living Coral! I am really excited to see this in more bouquets this year! Like I said, a dash of color in a simple bouquet can really make your flowers stand out. Seems like a hard color to pull off, but in reality it’s so easy to blend in with the rest of your colors. This mum was featured in a bouquet of deep plums, yellows, and greens to brighten a fall bouquet. You can see above, a hint or coral would have worked perfectly in a palette of pinks, reds, and sages. Something I’m seeing more and more of are bouquets made of one flower. This one as made by Molly Ryan Floral and is so simple, yet so elegant! A bouquet made of only one kind of flower doesn’t have to mean you’re left with a bouquet of roses! Talk with your florist and see what you can experiment with. These blooms, for example, are called mock orange, and they smell wonderful! Lastly, and this might be featured here because I’ve lived in the Pacific Northwest, but consider a bouquet that’s just a little “wild”. I particularly love this bouquet by Bramble Floral Design because it really shows you how romantic a bouquet can be if you let it get a little out of control. Alli does an incredible job playing with color, texture, and varying sizes. Her designs are completely inspired by what nature has to offer. Be inspired the same way she is and let your flowers do the talking!